Paw Patrol Tracker continues the series of Paw Patrol dogs. Paw Patrol Tracker is a chihuahua. He is the designed to portray a jungle rescue dog. 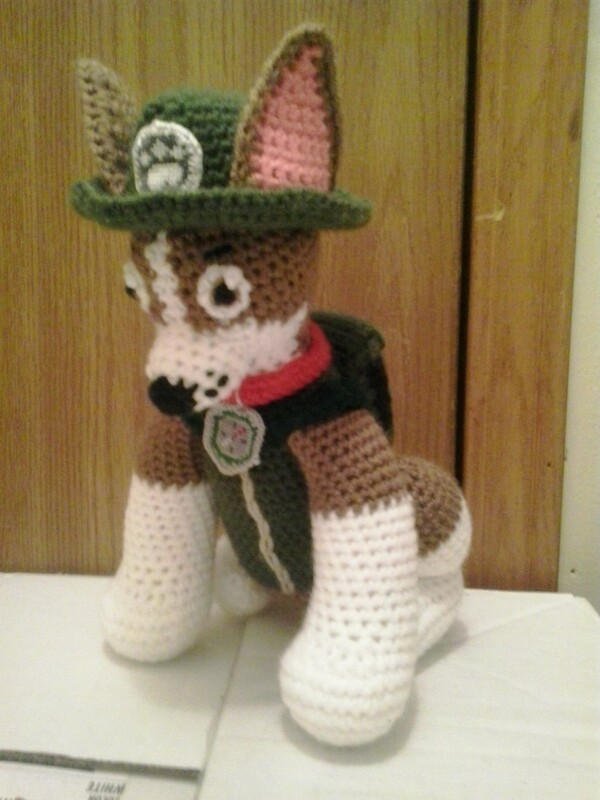 Thanks to doing the other dogs from the show, Tracker was much easier than if I would have made him by himself. Worsted weight yarn: Café latte, medium thyme, hunter green, perfect pink, white, black, and red. DMC floss: Green (700), gray (415), pewter (317), white, red (321), and grey heather (318). Rds 6-9: sc in each sc around. (36) Change to medium thyme after Rd 8. Finish off leaving a long tail. Weave tail through sc of Rd 49, pull tightly and secure. Weave in ends. Using gray, surface chain stitches up center of front of BODY for zipper. Embroider EYES and EYEBROWS on PAW PATROL TRACKER. Rds 10-18: sc in each sc around. (18) Change to café latte after Rd 18. Rds 11-13: sc in each sc around. (27) Change to café latte. STUFF LOWER PORTION OF HIND LEGS FIRMLY. STUFF UPPER PORTION OF LEGS MODERATELY. Finish off. Sew PUP PACK together. Stuff PUP PACK firmly and sew closed. Sew PUP PACK to PAW PATROL TRACKER. NOW WORKING IN CONTINUOUS ROUNDS. Finish off leaving a long tail. Weave in ends. Sew HAT to PAW PATROL TRACKER adding stuffing before closing. Rd 1: Holding INNER EAR and OUTER EARS together and working through both thicknesses, ch 1, sc in side of next 10 Rws, 3 sc in free loops of foundation ch, sc in next 10 Rws. Tracker and Paw Patrol are copyright Spin Master Entertainment and their respective creators.